(0 Customer Reviews) | Write Review 6 issues per year The Road Haulage Archive is a new series of one-off publications in the style of Vintage Roadscene magazine, each looking at a particular aspect of our road transport history, whether a lorry manufacturer, like Seddon, an operator, such as British Road Services or Tate & Lyle Transport, events like commercial vehicle shows, industries or areas of the country and so on. These are featured in a largely pictorial presentation, using the resources of well-known photographic archives, backed up by the memories of enthusiasts and industry professionals who were there at the time. An unrivalled wealth of information and period pictures go to make up an ongoing series which will build into a library of interest to all transport enthusiasts. The Road Haulage Archive is a new series of one-off publications in the style of Vintage Roadscene magazine, each looking at a particular aspect of our road transport history, whether a lorry manufacturer, like Seddon, an operator, such as British Road Services or Tate & Lyle Transport, events like commercial vehicle shows, industries or areas of the country and so on. These are featured in a largely pictorial presentation, using the resources of well-known photographic archives, backed up by the memories of enthusiasts and industry professionals who were there at the time. An unrivalled wealth of information and period pictures go to make up an ongoing series which will build into a library of interest to all transport enthusiasts. You'll receive 6 issues during a 1 year Road Haulage Archive magazine subscription. 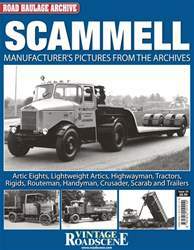 You'll receive 6 issues during a 1 year Road Haulage Archive magazine print subscription.